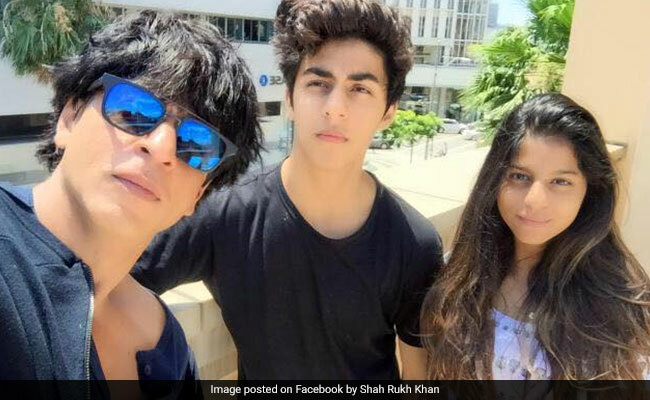 Shah Rukh Khan always comes up with thought-provoking captions for photos of his children and Wednesday turned out to be one such day when he zeroed in on a click of Suhana and Aryan Khan. "This image reminds me of the Yellow Brick Road... I hope they find answers they are looking for or at least have enough questions to lead a full life... #mysunshines," wrote the 53-year-old superstar father. Shah Rukh's "Yellow Brick Road" could be a symbolic reference to the road mentioned in The Wizard Of Oz, which was symbolic of a journey full of riddles and surprises for the fiction's main character Dorothy, who set out in search of the titular wizard. The latter part of Shah Rukh's caption falls in sync with the Yellow Road Brick's significance as he sends best wishes to Suhana and Aryan for their life ahead. Both Suhana and Aryan sport the limited edition Taxi hoodies from Helmut Lang's collection and can be spotted at a road crossing. Here's something little just as bonus trivia, courtesy what film critic and author Anupama Chopra wrote in her 2007 book titled King Of Bollywood: Shah Rukh Khan And The Seductive World of Indian Cinema. In 1983, Shah Rukh Khan was cast as the wizard in a play titled The Wiz (based on The Wizard Of Oz) for a school performance while he was at New Delhi's St Columba's School. Shah Rukh was about 18 at that time. While his work roster keeps Shah Rukh Khan busy in Mumbai, he often posts about missing Suhana and Aryan, who study abroad. Suhana is pursuing higher studies at Ardingly College while Aryan is currently studying films at the University of Southern California. Shah Rukh and his interior designer wife Gauri are also parents to AbRam, the youngest of the three Khan kids. On the work front, Shah Rukh Khan was last seen in Zero and has the biopic on astronaut Rakesh Sharma, tentatively titled Saare Jahaan Se Achcha, in the pipeline.